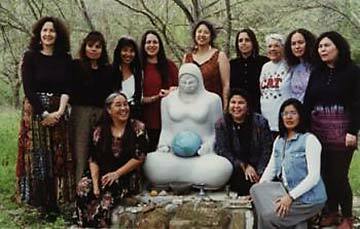 Alma de Mujer Center for Social Change was gifted to the Indigenous Women's Network in 1996 by Ms. Genevieve Vaughan for the use of Indigenous people. Thus Alma De Mujer Center for Social Change was created to provide a supportive, nurturing and healing space for Indigenous women and their families particularly in the south Texas area, who would not otherwise have access to such a resource and secondarily as a space where Indigenous women and their families can come to reflect, rejuvenate and gather to discuss issues of common concern. Over the years Alma has provided space for many individuals and groups. All funds raised are put toward the upkeep costs of the facility. The mission of IWN with regard to Alma is expressed in this vision statement: To maintain Alma de Mujer as a spiritually based center which advocates for social change, working within the vision of our Elders for the future generations and fulfilling our role as Indigenous women leading social change in our communities and nations. A Committee of local residents and representatives from various organizations provide direction into the programming and operations at Alma. Alma de Mujer is run under the guidance and leadership of an Austin-based inter-generational Local Council. Under its auspices, Alma de Mujer provides culturally based arts, environmental and leadership development programs that directly benefit Indigenous women, youth and children of southern Indigenous communities and that focuses on uniting Indigenous women from nations throughout North America thereby empowering them to address issues of common concern. Alma de Mujer is also a retreat center serving social change organizations from across the North American continent. A project of Indigenous Women's Network (IWN), Alma de Mujer Center for Social Change is a 22-acre retreat center located in Northwest Austin near Lake Travis. The Indigenous Women's Network was created in 1985 to support the self determination of Indigenous women, families, communities and Nations in the Americas and the Pacific Basin. In the process of promoting self-determination, IWN supports public education and advocacy, the revitalization of our languages and culture, the elimination of all forms of oppression, the attainment of self-sufficiency and the protection of Mother Earth for future generations. As a Center for Social Change, Alma de Mujer hosts and leads programs that serve Austin's Indigenous/Native American/progressive organizing communities. Alma de Mujer's primary programs focus on building Sustainable Communities, Arts and Culture, and Women's Leadership. We support Indigenous life ways that inform our programming in the areas of environmental stewardship, social justice activism, civic responsibility, traditional arts and social/personal well being. In addition, Alma de Mujer is a meeting space for social change organizations and a center for healing. To this end, Alma hosts gatherings for women and their families to learn about healing, and to partake in healing circles. All aspects of Alma de Mujer's programming are shaped and informed by a 13 member inter-generational Alma Council made up of local Austin community women. Alma de Mujer is funded and supported in part by the City of Austin through the Cultural Arts Division. Alma de Mujer's land is a paradise of unspoiled territory spanning Travis and Williamson Counties. Cypress Creek, a feeder for Lake Travis, runs through the property, creating a lush pond where native plants and wildlife flourish. The land is home to countless species of animals, including deer, possums, raccoons, wild boars, armadillos, and more. Over 40 species of birds, including three endangered species, have been sighted on the land.